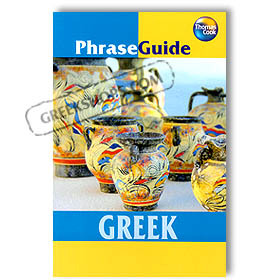 PhraseGuide Greek is designed for people on their vacation - making essential words and phrases accessible in a practical and user-friendly style. It's a beautifully designed little pocket-size travel guide including all the essential categories (greetings, eating out, shopping, getting around, accomodation, survival guide, emergencies, dictionary, and reference section). Filled with hints and tips on Greek culture and everyday life! *Includes both English-Greek & Greek-English Dictionaries packed with phrases and phonetic spellings for easy pronounciation!